It should be easy to do a visual inspection of your roof from the ground. If you notice something that seems out of sorts, then grab a pair of binoculars for a closer look. If you feel comfortable climbing on a ladder, then check out your roof that way but that might be a job better left for professionals. It might have been several months since you lit a fire in the fireplace. If you didn’t clean your chimney at the end of last winter season, then you definitely want to get it done before you light your first fire of the fall. It’s always good to not only get your fireplace clean but also inspected. The best time to buy firewood is when no one is thinking of firewood. That is right now. If you’re going to buy a lot of firewood for the entire fall/winter season, then it’s best to store it away from the house under some protective cover. Along with checking for any damage on your roof, you also want to go around the entire exterior of your home and check for cracks or holes in your siding and foundation. Could probably do minor repairs but it’s important to plug up those entry points not only to keep out the drafts but also uninvited pests. If you saw any icicles last year alone your rain gutters, then it’s a good indication that those gutters are clogged. You can wait until after the leaves have completely fallen off the tree before cleaning your gutters but if it’s been a while then you may need to make two trips up the ladder: one now and one at the end of fall. 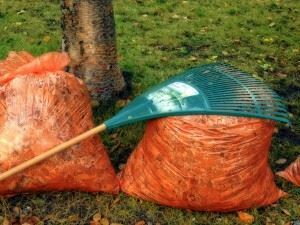 As you go through this fall prep, you may also spot a lot of rubbish you can get rid of. Whether that’s clutter you’re keeping underneath a deck or along the side of your garage it doesn’t do you any good to hold onto it. One call to Junk King Denver can make it all disappear. They’ll put a plan into action that involves two capable movers and a big truck. That’s really all you need to get rid of all your unwanted rubbish. It is a smart move to hire Junk King Denver to help get your home ready for fall. This entry was posted in Denver Junk Removal and tagged fall, home, junk, rubbish on August 27, 2017 by Junk King. Last updated August 27, 2017 .